It took me forever to read the last book in the series. And not because it isn't an excellent story, but I knew I wasn't going to like the ending based off the major outrage by fans. I took my time reading because I wanted to savory Tris and Four’s relationship. They were finally, what I hoped, out of danger and could really enjoy each other. 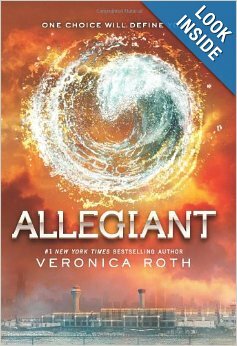 The truth, in their world they are never out of danger, and Tris and Four find themselves on different sides. Did I get a little tired of them bickering and almost breaking up? Sure. But reality is they were experiencing very stressful events. Life and death experiences can make anyone high strung. Did I like the ending? No, but I'm a happily-ever-after kind of reader. I live in reality, a world full of sorrow and death, so when I read I want to escape that reality. I understand there are plenty of people out there who love the tear-jerking sad stories. I don't mind reading them once in a while but I truly can't give them a 4 or 5 star rating because they aren't stories that I'm going to read over and over again. "Allegiant” is a well written book. This is a great Dystopia series. And I became fully involved in Four and Tris's life.